More Endurance Deaths in the United Arab Emirates (UAE)? 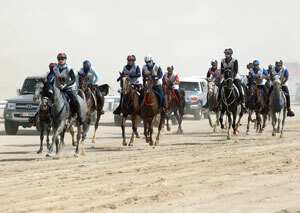 Despite the agreement, however, the Dubai Crown Prince Endurance Cup held on March 19th was downgraded to a national event, but had previously been listed on the FEI calendar as a CEI*** and a qualifying event for the 2016 World Endurance Championship hosted by Dubai this December. The FEI does not have jurisdiction over national competitions. When asked whether there had been a horse death during the race, the FEI replied, “‎We have already received an informal report from the event on 19 March stating that there were no incidents.” However, there have been reports of further horse deaths at a 100-km ride on March 15th and another at a 120-km ride on March 21st. The group Clean Endurance reported on their Facebook page on Mar 22, 2016, that a certain number of foreign riders decided not to participate in this event, following the German national federation’s example, which asked their athletes to abstain from competing. Clean Endurance are asking concerned horse people to support a petition asking the FEI to remove the World Endurance Championships from Dubai and instead stage the championships in a country which abides by FEI regulations. The petition currently has 5,585 signatures towards its 7,000-signature goal; it can be accessed on change.org here. – 93 disqualifications, failures to qualify or retirement due to rider retirement, irregular gaits, failed to complete, or metabolic. – 85 disqualifications, failures to qualify or retirement due to rider retirement, irregular gaits, metabolic, ground jury decision, one metabolic invasive, and one catastrophic injury to Texas, a 2006 grey gelding ridden by Sh. Mohamed Bin Mubarak Al Khalifa (BRN). Stop this awful disrespect of the horse. WEC MUST be removed from Dubai. They are putting two fingers up at the FEI. Rules they agreed to abide by are continually broken. Horse welfare has NOT improved. They don’t deserve to hold such prestigious event. The FEI seems to be striving so hard to prove themselves impotent and stooges of the UAE. Come on FEI you have a job to do and they are clearly not listening. Time to cut them lose. The UAE wants to dominate world endurance – and it certainly does, but not in a good way. It’s time to remove them from the calendar of international competitions run by the FEI and let their best rider/horse combinations travel to other NFs and compete within the rules under honest management. Dubai competitions consistently ignores all efforts to protect the welfare of these wonderful and noble animals. All competition whether it be racing or endurance riding involving the international community should be banned from being held in Saudi Arabia. Saudis’ simply do not care. I agree, WEC must be removed from Dubai. This nation has ruined our discipline. The completion rate on these rides are disgusting . In fact they are down right disturbing . Do the Arabian people have no shame !!! There is no expertise ! Here just down right greed selfishness and in my eyes DISHONOUR !!!!!! To use the term ‘Arabian’ is correct in the context of the Arabian horse (or when referring to ‘the Arabian Peninsula’) but there is no such a thing as the Arabian people (Arab people would be a more correct way to put it). However, I would like to point out that there are 22 ‘Arab’ countries in the world (from Morocco in the west, all the way to Oman in the east, and Yemen and Sudan in the south) and that most of these countries do not host endurance racing competitions (in fact, very few do). Instead of putting the blame on “the Arabian” other, perhaps we should pay closer attention to the nature of the global industries of horsemanship so we can make stronger arguments when defending animal welfare. The UAE and other Gulf States have brought our beloved sport into disrepute repeatedly, and always at the expense of the horses. They have no intention of respecting the rules, reducing the unsustainable speeds at which horses are ridden…or giving a damn about horse welfare in any way, shape or form. Endurance would be better off without their involvement. This is a truly shameful situation, and the FEI have yet again proven to be utterly ineffective thus far. No horse needs to ride that hard or that fast for any reason any time any where. Just abuse not horsemanship not a sport, torture is more like it. I am done looking at stupid people do damage to horses, they the horses have no choice, even the horses that survive the events, at what cost? At what toll? What is the point of ego (I won, you lost) on the back of an animal that dies as a result of giving its all for a hollow victory. Time for a reality check. I am so sick of this crap. They have ruined the sport of endurance. Dear Sheiks: “Have you no shame?” The rest of the world really needs to boycott their races of DEATH completely. Don’t take their money, don’t compete on their stage, don’t acknowledge their idea of sportsmanship (to the death of the horse we ride). It disgusts me and we need to stop competing with them completely.